I too have wondered why Detroiters elect someone like Kilpatrick. I have also asked why did the country elect someone like Richard Nixon. You and I have never been in the shoes of a poor black person who has always been ruled by someone who is white. We have never lived under a system where other citizens had greater rights and more freedoms than we did. For centuries blacks have been taken advantage of by their politicians and over most of that time it was a white person holding office. Being taken advantage of by someone like Kilpatrick was just more of the same, but at least it was kept in the community. After being slaves and oppressed for centuries, it takes time to learn what is the right way to govern. My guess is most black citizens saw Kilpatrick doing nothing different than many other Mayors preceding him. He was playing by the rules of the game. I further disagree with your statement of “no bankruptcy no grand bargain”. Detroit needed to declare bankruptcy but the Governor should not have needlessly stolen billions of dollars of art in the process. I know of no precedent showing the judge's ruling would be overruled. I also know of no precedent showing that it could not be overturned. A judge in a bankruptcy hearing is not charged with coming up with a plan of reorganization. His job is to facilitate one and approve or reject a plan acceptable to all parties. If they do not agree, he can force one on the participants. There were several appraisals done on parts of the art collection. One by the city came in excess of $4 billion and another done by creditors came in over $8 billion. These appraisals did not include all of the art. At the start of bankruptcy the city stated that estimates for the entire collection ranged from $10 to $15 billion. 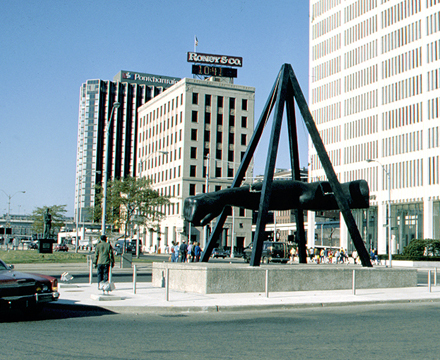 During the bankruptcy hearings a reporter from the Detroit Free Press stated that it was clearly established in court that Detroit owned the art. The city only received $500 million in present value terms for surrendering at least $4 billion in assets. During the bankruptcy a new creditor offered the city a loan in excess of $500 million that was rejected by the Emergency Manager and the Governor. If this alternative was chosen, instead of the Grand Bargain, the city’s present net worth would be at least $4.5 billion greater than it is now. There was never a final reconciliation made public of the financial effects of the bankruptcy. It is apparent the net worth of the city decreased as a result of the bankruptcy rather than increased. There was plenty of bragging that the city reduced its debts by $7 billion but nothing summarizing the value of what was given up. The other assets surrendered, in addition to the billions in art, included the Joe Louis Arena, rights to future cash flows from the Windsor Tunnel and parking revenues from several parking lots and garages. Combined, the assets given up were greater than the debts forgiven. This is not what is suppose to happen in a bankruptcy. Based on the above, I believe there are grounds to void the agreement. A troubling side note is Detroit's Emergency Manager, Kevyn Orr, came from the law firm of Jones Day saying he had no plans of returning to the firm after Detroit's ordeal was over but did in fact return to Jones Day as a Partner. Further, he hired Jones Day as the lead attorney for the city. Jones Day received legal fees from the city in the vicinity of $150 million. In days gone by professional firms such as attorneys and CPA’s were expected to avoid any conflicts of interest and any appearance of a conflict. Perhaps that standard is now considered old fashioned. After objectively analyzing the facts of the Grand Bargain, one must conclude it was a GRAND SCAM. It has been suggested that Congressman John Conyers has asked the Justice Department to look into this. Let’s hope so.